Do you like birds? More specifically do you like hummingbirds? I know they are a favorite of ours to watch out our big front window when the weather is warm enough for them. I've just always enjoyed watching them zip around from one place to another so freely. We've even put out feeders just so they would stick around a little longer for us to see. This DVD is a definite must see if you like to watch them. I never knew there were so many beautiful colors of hummingbirds. Even my daughter that's eight enjoyed watching along with me. About: Hummingbirds represent one of nature's most interesting paradoxes – they are the tiniest of birds, yet they qualify as some of the toughest and most energetic creatures on the planet. Stunningly beautiful high-definition, high-speed footage of hummingbirds in the wild combined with high-tech presentations of their remarkable abilities help us to understand the world of hummingbirds as we never have before. 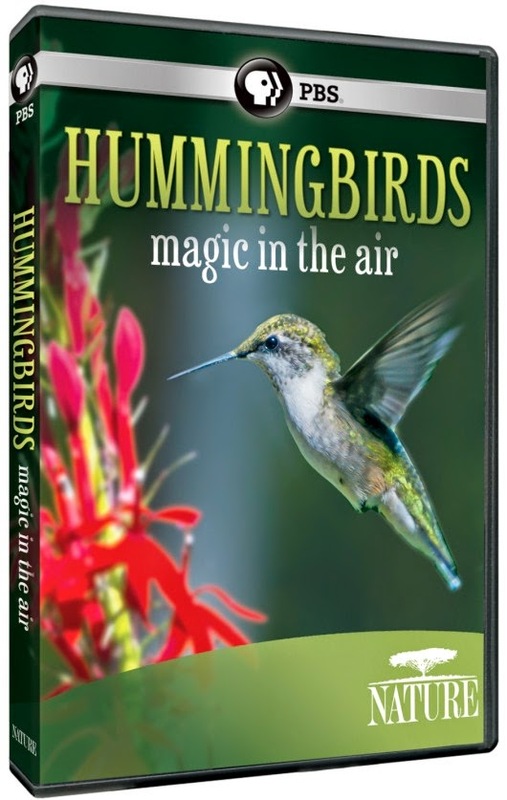 Win it: 5 lucky reader will each win a HUMMINGBIRDS: MAGIC IN THE AIR DVD. This giveaway will end February 3rd at 12:00 AM EST. The winner will have 48 hours to respond to my email. If no response, a new winner will be chosen. Open to residents of the US. I like the American Bald Eagle. Cardinals are my favorite bird. Actually hummingbirds! They come around in the summer around my porch and I love seeing them! I love Whippoorwills and woodpeckers and my daughter says hummingbirds. I don't really like birds, but my parents really like hummingbirds. I don't have a favorite, but my mom loves to watch her hummingbirds in the yard and would enjoy this dvd. dont really have a fave\, but love looking at pelicans, blue jays, cardinals, hummingbirds are of course fascinating. HUMMINGBIRDS ARE MY FAVORITE. I WAS LUCKY ENOUGH TO VIDEOTAPE A MOM AND TWO BABIES IN THEIR NEST SEVERAL YEARS AGO. I ALSO LOVE TOUCANS, BLUEBIRDS, DOVES, QUAIL AND PEACOCKS. SWANS, DUCKS AND CHICKENS ARE GREAT TOO! My favorite bird is the Tupi (also known as the scarlet ibis). I love wood ducks and their colors. I love cardinals and hummingbirds! I really like blue jays and owls.